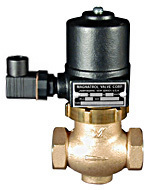 See individual options listed below for availability for use with specific valve types. For modifications available through our Clark Cooper Division, go to the Modifications Page. 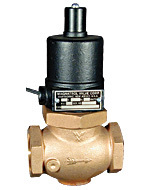 Enables manual opening of solenoid valve during power failure or to override automatic controls. Furnished for clean liquids to reduce water hammer effect sometimes encountered in long pipe runs by slowing valve closing. Consult factory for valve type availability. 3/8"-16 thread can be furnished in bottom of body to facilitate mounting on bracket. (Not available on 2", 2-1/2" and 3"). 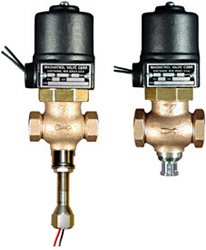 Enables rapid opening of solenoid valve. Can be chain operated for use at inaccessible locations. Provides a manual method of reducing or throttling the flow. 1/4" NPT plug supplied in bottom of valve to facilitate draining of liquid from valve body. See the Position Switches page for this option. Can be used with any other option. 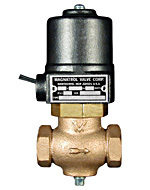 Type D, G & GR Valves can be furnished with 1/8" tapped hole for pilot connection or pressure gauge. Provides 3 prong male connector for easy power connect / disconnect. Female connector provided by others. 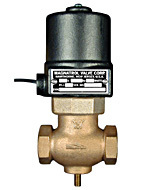 The "HUM FREE" option eliminates the "AC hum" associated with AC operated solenoid valves. 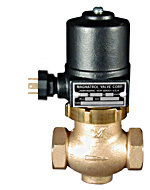 Enables valves to be used where an AC hum would not be acceptable and AC is the only power source available. IE: Hospitals, labs, schools (class rooms), homes, office environments etc. & when 24 vac is required for 40 series valves. 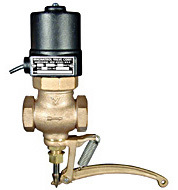 The Leak / Dead Tight Option is used where Low Pressure Tight Shutoff is required. This option offers ‘soft’ resilient seating or 'gapless' seal. Consult Factory for Max. Diff. Pressure and Valve Type availability. 150 lb. or 300 lb. Flanged ends available on all stainless steel valves. 150 lb. Flanged ends available on bronze valves. Are Explosion-proof and NEMA 4, 7C & D, 9E, F & G suitable for use in hazardous locations requiring Class I, Groups C & D & Class II Groups E, F, and G equipment. Are suitable for use in locations requiring a NEMA 4X designation. "ZP" (ZincPlating) replaces the standard paint used on the Coil housing (cup and base). The additional corrosion protection satisfies NEMA 4X requirements. 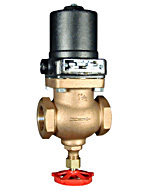 Internal construction, pressure ratings, power consumption, and external dimensions are the same as for standard valves.